Hey everyone! 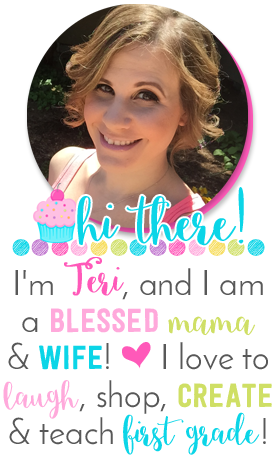 I'm happy to be guest blogging for Mrs. Cupcake while she is on vacation! I'm so happy and distracted about it that I can't think of anything to write about . . . of course. So after talking to Hadar, she gave me the idea of writing a re-run. Maybe some of you haven't seen this before because you don't know who I am, and this will be brand new for you. And maybe the rest of you have seen it, but you forgot about it, and it will inspire you to create it before the new year begins! And if you fall in the category of "I've seen it, I already had it, let's move on, shall we?" then I apologize. Centers are always a favorite in my room. If you do the Daily 5, you could use this for Work on Writing. It's one of the most popular centers in my room every year. It's the Post Office Center. 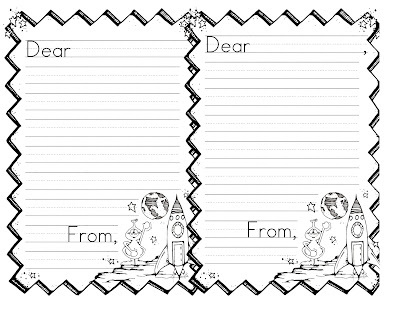 The kids get to write to each other on special stationery (I have 4 choices) or they can even write to kids from other classes. They put the notes in the mailbox and, when I remember, I deliver the mail to the appropriate cubby or class. Some kids like to write to their kindergarten teachers and tell them how much they miss them. (I frown upon that, but I do encourage them to write to me, and I hang a HUGE word bank with ideas right next to the center. Examples include beautiful, smart, adorable, funny, pretty, amazing, You, Are, The, Best, First, Grade, Teacher, Ever!, etc.) Letter writing is not a "standard" in first grade but our second grade teachers seem to appreciate the frontloading (big word!) that we do with this center. I suggest READING the notes before delivering them. Some first graders think they can tell others that they LOVE them and want to be their boyfriend or girlfriend (gasp!) and others think they can tell their friends that they are stoopid, dum, and uglee. And still, even others think they can tell me that I am SHORT. In all of these instances, the culprits SIGNED THEIR NAMES because I taught them how to do that and so they did that and they incriminated themselves. CSI - FIRST GRADE. The kids read his problems and then write back to him. They try to come up with solutions and I really encourage them to ELABORATE. Occasionally, I will find this in the mailbox: "Dear Wrinkes, yes. Love, First Grader" or "Dear Wrinkles, no. Love, First Grader". Wow. Profound. Wrinkles can rest easy now. Click on the pictures above to get this stuff if you want it. I hope you've enjoyed this re-run. Next week, an all new episode will air. Thanks, Mrs. Cupcake, for me letting be a guest over here! Kristin! I love this post, and I fall under the category that I DO know who you are, but I haven't seen this post before. I love the idea of having a class "pet" that you can write to! Teri, I hope you are having fun on your vacation! Great post! I remember it but I still had to read EVERY WORD. Thanks for sharing this post! I, surprisingly, had not read it. What a great idea! I, too already know and love Teeny Tiny Teacher, but I hadn't read this post either! Wrinkles is so cute and I just might have to steal him!! Thanks Kristin and Teri! Brilliant. Just brilliant. Problem solving at its best! You should charge for this girl!!! But, I'll take the FREEBIE with a BIG old smile on my face :) Thanks friend. Great post today. Love the post Kristin! Do you have to be a Scribd member in order to download your freebies? This is such a wonderful idea to go along with my writing center this year! I'm glad you did a re-run!! :) Thanks so much! Great idea and your post made me chuckle! Thanks! Wrinkles is so darn cute! I am stealing this idea for sure! :) THANKS! I love this idea but I can't seem to download it....HELP! I really love this idea, but can't download it either. Awesome idea. I can't download it either. It is telling me I need to be come a Premium Reader. Ah well! As a school counselor, I LoVE this! I think I will use this with my classroom guidance. Thank you for the awesome idea! Kristin! I totally remember reading this originally but I don't care because I am crying laughing over here. I am so doing this next year!! I love this idea and am going to be on the hunt for my own version of Wrinkles! (Guess I'll have to head down to the local Worried-Looking Stuffed Animals Shoppe!) I am a school counselor always looking for ways to help kids learn to build empathy and problem-solve - and also looking for ways that I can support the learning they do in the classroom! Thanks for the freebies! I will definitely be using these next year!!! This post was one of the very first things I ever pinned. LOVE it! What an awesome post! Also glad you did a re-run! I am unable to download the documents using scribd. Are the files accessible through google docs or a different method? Thanks so much for sharing!! What a fun idea...I bet I could make it work in Kindergarten too. where did you find the mailbox? This is such a cute idea!! This is precious! Great idea!! I'm really excited about this idea! Such a cute idea! I'm going to try this with a Wrinkles of my own! I am a new follower but I am already looking forward to each and every post of yours - you make me laugh each time! I just LOVE this idea!! Where is the mailbox from? What an adorable idea!!! Can't wait to try this out!! 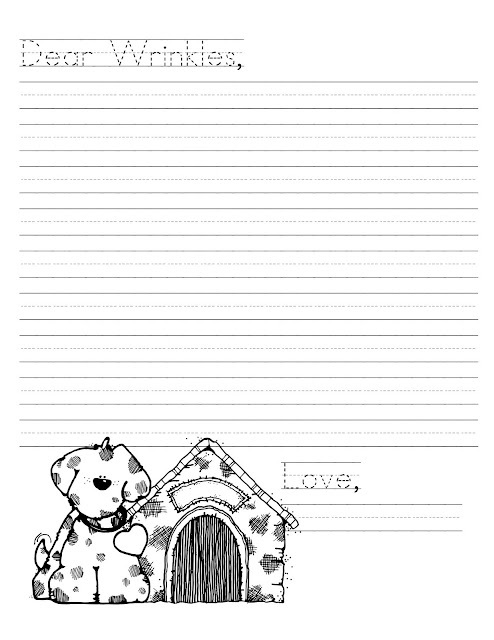 Absolutely love the cute letter writing activity with the puppy and all your Made-It items were so cute. I have quite a few ideas from your posts. Gave you an award, so stop by my blog and pick it up when you get a chance. 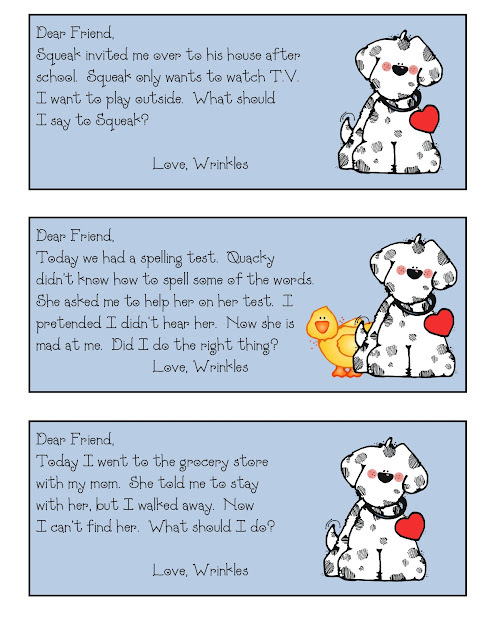 Could you please tell me where you get your ideas for the wrinkles problem cards? This is exactly what I've been looking for! Attendance Board, Box Tops, and More! Back From Vacay With a Giveaway! Currently and Made It Monday... Late!